Before we leave Clarence Clemons and Bruce Springsteen for next week’s trip to Hades, Mythfire would like to respond to a few comments generated by the last two posts. Readers understandably take offense to the suggestion that the exceptional friendship between Clemons and Springsteen can somehow be reduced to being a product of the mind, i.e. psychology, or fantasy, i.e. mythology. This reaction is not only understandable but appropriate except for one thing: this is not what Mythfire means by psychology or mythology! Mythfire would like to focus on the following comments from Clemons: “I swear I have never…I will never forget that moment…You know. And right now when I’m on stage with Bruce, I still feel that moment [. . .]. It was a very magical moment. He looked at me and I looked at him and we fell in love and that’s, that’s still there. It’s still there.” Two psychologists often referenced in these posts, C.G. Jung and James Hillman, would look at the words “magical” and “love” and at the sense of timelessness or infinity conveyed in Clemons’ retelling and would call his experience soulful, mythic, and archetypal. It is a shared experience of something larger than us, something meaningful…perhaps even divine. “The decisive question for man is: Is he related to something infinite or not? That is the telling question of his life [. . .]. If we understand and feel that here in this life we already have a link with the infinite, desires and attitudes change. In the final analysis, we count for something only because of the essential we embody, and if we do not embody that, life is wasted. In our relationships to other men, too, the crucial question is whether an element of boundlessness is expressed in the relationship. Due in part to Christianity’s suppression and/or assimilation of the energies contained within the figure of Eros — along with the energies of the other Greek gods and goddesses — it is difficult for many of us to differentiate between the many “faces of love” as Hillman does in the above quotes. Another consequence of leaving Greece behind is that we tend today to describe love in purely human egoistic terms. 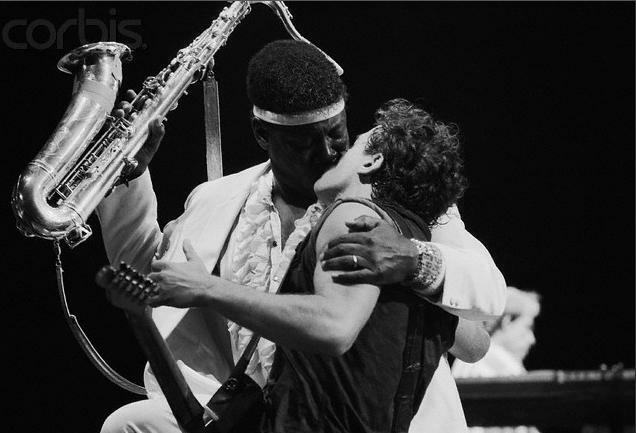 In the case of the picture of Springsteen and Clemons kissing, we are inclined to either sentimentalize, moralize, or perhaps even sexualize the love displayed. Our very inability to distinguish the different faces of love makes us uncomfortable with them, unable or unwilling to recognize much less practice them. In short, our egos have trouble processing the idea that there could be a greater experience available to us than our minds’ current conceptualization of love. Following the Platonic tradition, Hillman makes clear that love is personal and human and yet also more than these. That is, love is archetypal, i.e. “beyond human” and thus divine, infinite, boundless, and multiple. As indicated above, in the days of ancient Greece the multiple faces or styles of love were mythologically laid at the altar of the god Eros. Today we might say that via their unexpected lasting love for each other Clemons and Springsteen had a spiritual or mythological experience in the best and deepest sense of the term. To repeat from earlier posts: Springsteen’s eulogy of Clemons reveals the infinite quality of their love, how it preceded them and will last long after they are gone. There can be no question that they shared a true experience of the archetype of Eros. Finally, Clemons and Springsteen’s love was also psychological for it affected their very souls (Lat. psyche) – a fact nowhere more evident than in their music and, it would seem, their video interviews. Note: Last week’s post mentioned Hillman’s four main modes of soul-making. This week’s post could be viewed as an example of the first mode, “personifying,” in which we identify and name the various archetypal figures at work in and through our psyche in any given situation. Ultimately, the purpose of identifying and naming these figures is so that we might learn to relate to and through them more healthily and effectively. One of the archetypal figures Hillman mentions more than once is Eros. The entire quote, taken from page 325 in the Vintage paperback edition of Memories, Dreams, Reflections, is worth quoting in full: “The decisive question for man is: Is he related to something infinite or not? That is the telling question of his life. Only if we know that the thing which truly matters is the infinite can we avoid fixing our interest upon futilities, and upon all kinds of goals which are not of real importance. Thus we demand that the world grant us recognition for qualities which we regard as personal possessions: our talent or our beauty. The more a man lays stress on false possessions, and the less sensitivity he has for what is essential, the less satisfying is his life. He feels limited because he has limited aims, and the result is envy and jealousy. If we understand and feel that here in this life we already have a link with the infinite, desires and attitudes change. In the final analysis, we count for something only because of the essential we embody, and if we do not embody that, life is wasted. In our relationships to other men, too, the crucial question is whether an element of boundlessness is expressed in the relationship. The feeling for the infinite, however, can be attained only if we are bounded to the utmost.” Italics have been added in the post above . This entry was posted in Archetypal Psychology, Art/Creativity, Culture, Depth Psychology, Myth, Mythfire Responds, Tributes. Bookmark the permalink.